Time to play chess…sort of. This slots online game takes a chess theme to the next level, there is a mass of chess pieces that make up the reels of the game. 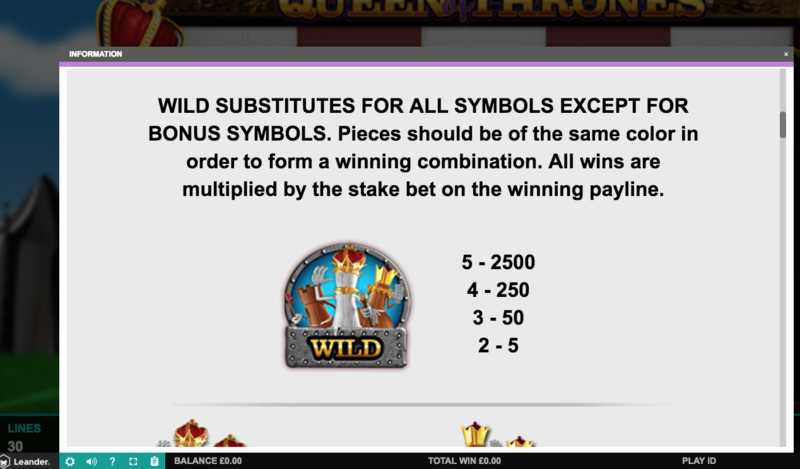 This aside, it’s a traditional slot game whereby symbols will need to be landed in a row for a cash pay-out! So, if you like a traditional board game atmosphere then this one could be for you because even the special features are all based around these rules. 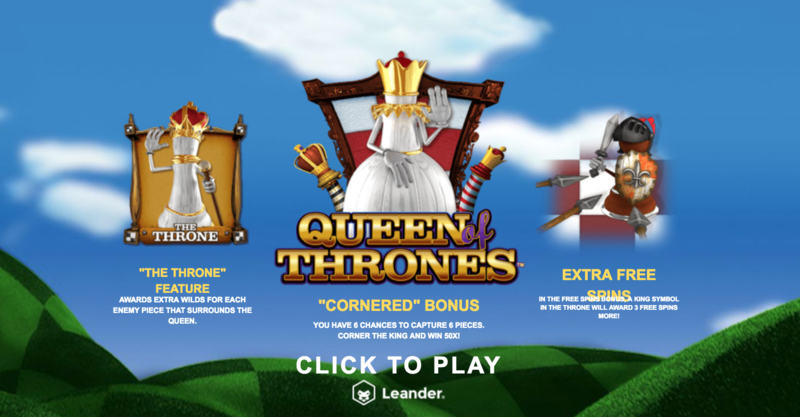 Leander Games are the developers of this online slot game and they have stood the test of time, having been around for over 10 years. Like many other developers, they pride themselves in developing slot machines based on both iconic and innovative themes. On top of this, they aim to develop up to date software which works effectively online and does not require any down loads. The Argentinian based company have formed calibrations with many other key developers in the industry. They have a wide variety of games available so it is worth checking out their library to see what’s out there! If you're a fan of promotion slots and bonuses, then Easy Slots have a whole range of them to choose from, browse by clicking the link! The Throne is a great feature which is activated when the Queen symbol makes her majestic presence – this will appear on the centre square if the spot. She will then use her powers to turn the surrounding symbols into wilds. You know what they say…the more wilds, the more wins! The Big Capture is a bonus round is activated when you land the correct symbols on reels 1, 3 and 5. This will conjure a chess board of 25 squares, some hide a chess piece and some an X. For every piece you choose, you win an additional prize and every X wins you nothings. This is a five-reel slot game with three symbols to a reel. In this game, there are a fixed 30 win lines and you can set it up for 10, 15 or 30 free spins. The wild symbol encompasses three different chess symbols which will boldly substitute for every other symbol apart from the bonus symbols. The chess piece also symbolises the highest paying piece at 2,500x your stake. The King is most valuable chest piece and just as in real life, the pawn holds the least value. This slot is fairly simplistic in nature, but sometimes we need that to appreciate the slot game itself. Although the theming does not ooze creativity, it is a solid theme with good bonus rounds added on. The suspense adds much value to this game, especially when you get to choose a space and risk gaining a cash prise versus sweet nothing! Leander games have produced a go-game here that provides a relaxed gaming presence. This game will appeal to more than a chess lover and the ambient music sets a relaxing atmosphere to have a spin in. Arguably, the best feature here is the auto spin element but overall it is definitely work giving it a go. Have a go at more online slots games now!